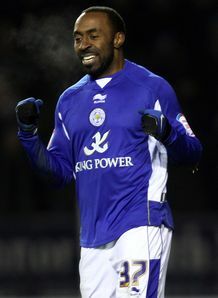 Darius Vassell is set to miss the rest of the season after undergoing knee surgery. The Leicester City striker - a lynchpin of Sven Goran Eriksson's strike force - tore medial ligaments and ruptured his cruciate ligament in the Foxes' 3-2 away defeat to West Ham United and needed surgery to repair the damage to his knee. The 31-year-old has successfully undergone surgery but will be out of action for six months - meaning he is likely to miss the remainder of the Foxes' Championship campaign. The former England man has appeared 44 times in royal blue having been signed by Eriksson from Turkish side Ankaragucu last year. He has scored five Foxes' goals. Meanwhile, Aleksandar Tunchev has rejoined his Leicester City teammates after the expiry of his loan deal at Crystal Palace. The Bulgarian international joined the Eagles at the start of the season to gain first team experience following his lengthy injury lay-off. He made ten appearances for Dougie Freedman's side, helping them to sixth in the Championship table.